(Above) Posed render of our four initial playable characters. Saurian will be offering four playable characters in the basic "full version" of the game. The initial early access version will feature only the dromaeosaurid (raptor) dinosaur Dakotaraptor as playable. Pachycephalosaurus, Triceratops and Tyrannosaurus will be added incrementally, leading up to the final release. After the basic "final" version of the game is complete, two more playable animals, species to be chosen by our wonderful Kickstarter backers, will be added in later updates. Below you will find a basic introduction to our initial four playables, giving a small amount of detail as to their gameplay style and habits. Dakotaraptor is a nightmare to many herbivores of Hell Creek. A sturdy ambush predator, it is capable of intense bursts of speed but unable to sustain them for long. This gives it the perfect set of skills to burst from the foliage and mow down unsuspecting prey. Much like komodo dragons, Dakotaraptor will form loose associations with each other to bring down large herbivores or feed on carcasses. Feeding works on a hierarchy, with the larger raptors feeding first and the smaller animals lower in the pecking order. Dakotaraptor often fight, kill and even eat one another during feeding. Vulnerable to adults, as well as other predators, immature Dakotaraptor are light and agile, able to climb trees to escape danger or ambush small prey lurking below. Young juveniles even posses some limited flight capacity. Although hardy and belligerent, Pachycephalosaurus is generally a vulnerable prey animal in the Hell Creek environment. Because of this it prefers to live in densely forested areas to avoid large adult T. rex. Not without weaponry of its own, Pachycephalosaurus will fight back against Dakotaraptor or young T. rex if provoked. It is capable of breaking bones with its famous domed head. A multifunctional tool, this dome is also used in territorial battles and to deflect foliage when running through the forest. Pachycephalosaurus adults mate for life and both parents raise their young together for several months. Male Pachycephalosaurus, distinguished by their bright red heads, are fiercely territorial and will engage in head and flank butting contests. Herbivorous animals, they feed selectively on low growing vegetation. Triceratops are the bane of Hell Creek’s predators. Even a match for the great T. rex, these animals are massive, bear formidable weaponry and are extremely aggressive. Adult Triceratops are able to chase off most potential threats. Female Triceratops live in loosely associated groups, sharing resources and providing mutual protection. Males however, will not tolerate other males, and aggressively defend breeding rights to the local female population. Females will guard their nests and young, and immature animals will associate with adults as a shield from predators. Males and females can be distinguished by differentiation in frill pattern, with males showing the more elaborate display. Both sexes will utilise their horns in intraspecific competition over resources, territory, or social hierarchy. Triceratops can feed on a wide range of small to medium height vegetation, seeking out forest edges for the best fodder. Tyrannosaurus is the apex predator of the Hell Creek environment. In order to sustain their requirements for food, adults occupy large territories which they defend diligently. If two adults meet outside of breeding season, the results are usually violence, face biting is especially common. During breeding season, males and females locate one another and perform courtship displays by emitting low frequency sounds. Although nothing is off the menu for an adult T. rex, they favour slower moving hadrosaurs and ceratopsians as food, targeting young or weak individuals, as most smaller prey items are generally too fast and nimble. Pairs dissociate after breeding and it is the male that watches the eggs and young. T. rex actually show strong parental care, watching over their broods for years until they reach a moderate size. At this point the father will finally depart but the juveniles will stay together as a sibling pack, even bringing down prey together, until they reach adult size. Unlike the adults, immature T. rex are extraordinarily fast and use this advantage to chase down prey such as the Hell Creek Ornithomimid and Anzu. This means they do not compete directly with the adults for food. Anzu is the jack of all trades in the Hell Creek ecosystem. As an omnivore, Anzu is able to take advantage of both high quality vegetation and small prey items, particularly the eggs and hatchlings of other dinosaurs. Males are larger and much flashier than females, resulting in both sexes occupying a slightly different niche from one another. While not the fastest dinosaur in Hell Creek, Anzu’s first choice in dealing with threats is still to run. 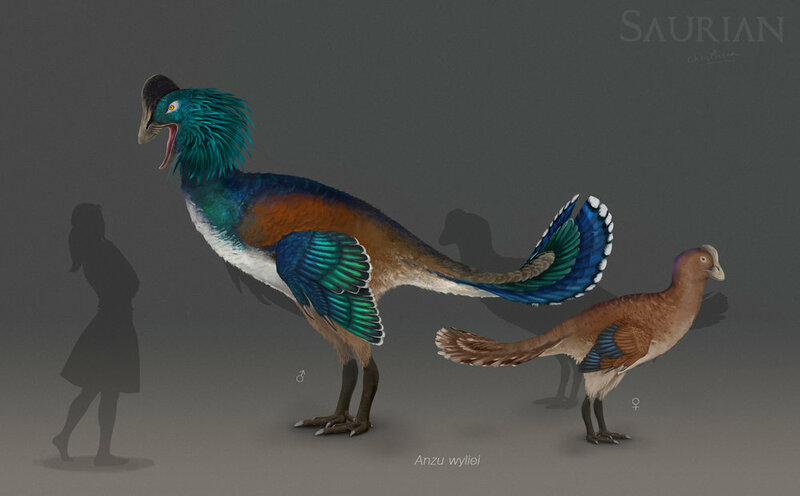 Perhaps Anzu’s most unique skill is its ability to mimic the calls of other dinosaurs in the ecosystem, a handy tool for both attracting prey and bluffing potential threats. Ankylosaurus lives a largely solitary life. Ankylosaurus is a very territorial animal, and tolerates other members of its species only during breeding season. While eating is a full time job, Ankylosaurus gains significant benefits from eating specific plants, and therefore must range widely and defend choice plots of foliage, not only from each other, but from other herbivores as well. While adults are rarely bothered by predators other than Tyrannosaurus, young ankylosaurs are vulnerable to many Hell Creek predators due to their still forming armour, and must either hide from predators or seek shelter in the company of more intimidating targets.